Christmas has finally arrived, which means you can expect to get your most wanted football presents! But you could also participate in our advent calendar for a chance of winning some awesome prizes! Sounds interesting? Then keep on reading. 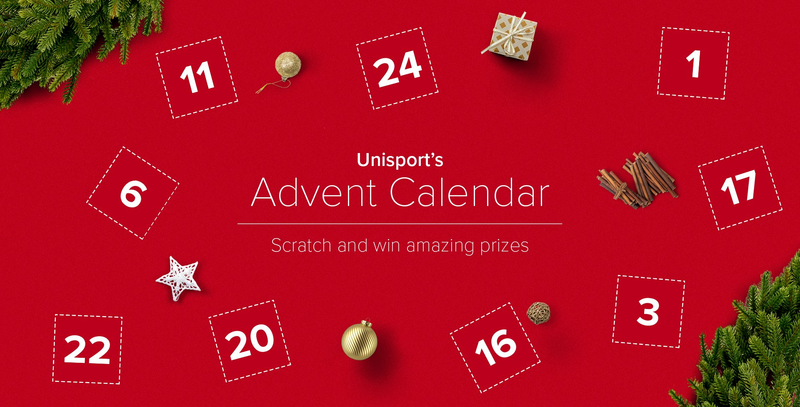 Unisport is more than ready to celebrate Christmas. We’ve done it previously, so this year shouldn’t be differently, and now you can even win some awesome prizes. We have made an advent calendar, where you can win 1 year supply of football boots (1 pair of AG, 1 pair of FG, and 1 pair of IC football boots). The only thing you have to do is come back every day, and answer the questions in the Advent Calendar - then you automatically participate if you answer correct on the answers. So, you’re going to be tested to the limit on things about Unisport or other events that have happened throughout the year at Unisport. And psssst.... Remember, the more doors you open and answer correctly, the higher your chance of winning, so come back everyday to enhance your chances. WIN 1 YEAR SUPPLY OF FOOTBALL BOOTS RIGHT HERE. We will have awesome deals throughout the Christmas. We will keep our social media hangouts updated with the latest deals. But don’t miss out on some of the Christmas gifts of the year, right now we have the PLAYR, new Tiempo colourway and the Nike Snood as some of the Christmas presents of the year. Get more inspiration through Facebook, Instagram or our YouTube channel, where we frequently are going to give you inspiration on what to get for Christmas!